There is only a limited number of studies about the abundance of microplastics on the seafloor. Comparing concentrations in different areas has proved challenging since the methods for sampling and extracting microplastics from sediments vary considerably. Studies may have focused on different size fractions of microplastics and reported their results in different units. In spite of the inconsistencies in methodology and reporting, it seems that microplastics are ubiquitous in the seafloors around the world. For example in the east coast of the United States microplastics were found in each three sampling locations along the coastline. The most prevalent plastic type in this study was fibres, but also fragments and a few pellets were found. According to many studies, often fibres seem to be the most dominant type of microplastics in sediments: for example 15 out of 37 sediment samples taken from the southern Portuguese coast contained microplastics, from which 84% were fibres made of semisynthetic rayon. In addition, also polypropylene (PP) fragments were found. Similar results have also been obtained in a study made along the Belgian coast, where microplastics were present in all six sampled locations. A majority of particles consisted of plastic fibers (59%), which were made of polypropylene (PP), nylon (PA) and polyvinyl alcohol (PVA). Other particles were granules (25%) made of polypropylene (PP), polyethylene (PE) and polystyrene (PS), spherules (12%) made of polystyrene (PS) and films (4%) made of nylon (PA). The sampling sites were located in harbors, coast and offshore stations, and these sites varied in their microplastic compositions and concentrations; spherules were found only in harbors, which also had higher microplastic concentrations compared to coast and offshore stations. Additionally, within harbors largest concentrations of microplastics were detected at the inner harbor stations, which was suggested to be due to high riverine inputs and low flushing rate of the enclosed harbor area. A study made in the lagoon of Venice, Italy, also found highest concentrations of microplastics in the inner parts of the lagoon and observed that high concentrations correlated with the finer fraction of sediment. Similar correlation was also found in a study conducted in Danish waters: there was a strong relationship between microplastic concentration and both the percentage of finer fraction of the sediment (< 65 µm) and the percentage of total organic carbon in the sediment. These results thus suggest that microplastics tend to accumulate in areas with low hydrodynamics. In contrast to other studies, this Italian study observed irregular fragments being most common (87%) followed by fibers (10%), plastic films (2%) and pellets (1%). Smaller particles were more abundant than larger ones: 55% of particles were smaller than 100 µm by size, 37.6% were 100–500 µm and only 7.1% larger than 500 µm. When identifying the polymer types, 48.4% of the microplastics were made of polyethylene (PE) followed by polypropylene (PP) with its 34.2% share. Other polymer types included polyester, polystyrene (PS), polyacrylonitrile (PAN), alkyd resin, polyvinyl chloride (PVC), polyvinyl alcohol (PVA) and nylon (PA). Average microplastic concentrations in seafloor sediments Note different units in the reviewed studies. A pilot study on microplastics in seafloor sediments was conducted in the Swedish west coast already in 2007. Two harbour sites sampled in the study showed considerable variation in the microplastic content of their sediments. In the Tjuvvik harbour 7 microplastic particles per 100 ml of sediment was found; on the contrary, in the Stjenungsund harbour the concentration yielded 332 plastic spheres in 100 ml. The difference in the concentration and type of litter showed that there is a local littering source at Stenungsund – unusual high concentrations of microplastic spheres were also found from the surface water samples of the same location. A preliminary study examining microlitter on the seafloor next to Helsinki, Finland, compared sediment samples next to two discharge sites of waste water treatment plants and one reference site. Even though the microplastic concentration was higher in discharged wastewater compared to the environment, concentrations were not observed to be higher at the discharge sites. This was suggested to be due to rapid mixing of wastewater with sea water in open sea areas, which prevents accumulation in the discharge sites. In all studied sites the concentrations of fibres varied from 1.7 to 4.7 kg-1 (wet weight) and concentration of synthetic particles from 0 to 7.2 kg-1 (w.w.). Recently microplastics have been studied also in the deep sea. The first study about microplastics in deep sea sediments was made in 2013 and found plastic fragments in the top centimetre of deep sea sediments in the Mediterranean, Atlantic Ocean and Atlantic sector of the Southern Ocean. Concentrations of microplastics in the samples were low, less than 4 particles per square meter. In a different study, samples collected from the Mediterranean Sea, southwest Indian Ocean and northeast Atlantic Ocean revealed a higher prevalence of fibres on the seafloor: fibres were found from every sample and their concentration ranged from 1.4 to 40 pieces per examined 50 ml of sediment. Most of the fibres (56.9%) were made of semisynthetic rayon, but of the remaining fibres polyester was the most common material followed by other plastics including polyamides, acetate and acrylic. When comparing the results to the surface microplastic concentrations, microplastics seem to be four orders of magnitude more abundant on the seafloor. Even though the difference may be partly due to different sampling methods, it was concluded that deep sea can possibly act as a major sink for microplastic litter. An expedition to the Kuril–Kamchatka Trench and its adjacent abyssal plain in the northwest Pacific has also discovered microplastics in the seafloor sediments collected from the depth of several thousand meters. From two size fractions (>500 µm & >300 µm) smaller microplastics were more numerous. 75% of the found particles were fibres and remaining 25% consisted of various fragments and paint flakes. Microplastics occurred both in the surface layer of the sediment (0–2 cm) and deeper sediment layers (2–10 cm). It was suggested that since the islands of the Kuril-Kamchatca area have low population densities, the origin of found litter may be in Japan and Russia, from where it might be transported to trench via bottom currents. 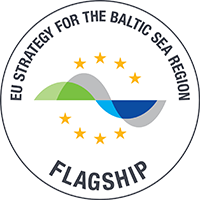 The BLASTIC project (2016-2018) aims at reducing plastic waste and, thereby, the inflow of hazardous substances into the Baltic Sea by mapping and monitoring the amounts of litter in the aquatic environment.